One of Kimberley’s major attractions, the Big Hole and Kimberley Mine Museum, was once a flat-topped hill and is now an awesome hole - the largest hand-dug excavation in the world - dug by picks, shovels and sheer determination, measuring 215 metres deep with a surface area of some 17 hectares and a perimeter of 1,6 km. The Kimberley Mine site started on or about 16 July 1871 and by 14 August 1914 all mining activities ceased. By that time it had yielded 2 722 kilograms of diamonds extracted from 22,5 million tons of excavated earth. Today the Big Hole is surrounded by original old buildings from days gone by, relocated from their earlier sites to form a magnificent open air museum. 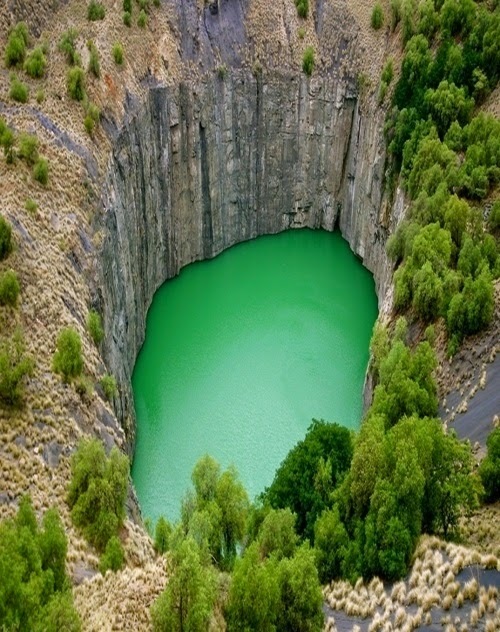 Kimberley, the capital of the Northern Cape province, is known as the Diamond City. Start your exploration of the city at its main attraction: the Big Hole. Imagine a hand-dug hole the size of eight football fields and you have some idea of the labour that went into creating the Big Hole. Adjacent to the Big Hole is the Kimberley Mine Museum, which brings to life the way the city was during the frenetic days of the diamond rush. Many of the buildings here are originals that have been moved over the years to this spot. If you are not claustrophobic, take the guided tour of a once-operational diamond mine which descends a staggering 840m below the earth. A few kilometres from the city centre lies Kimberley’s oldest residential suburb, Belgravia, which dates back to the 1870s. These homes were built at the peak of diamond trade. This is where South Africa's mining dynasty's patriarch, Harry Oppenheimer, was born. It's said that there once was more millionaires in this area than anywhere else in the world.